Late Monday, we showed you a picture of the Motorola DROID Ultra wearing a 'V' shaped black and white racing stripe down the Kevlar back. 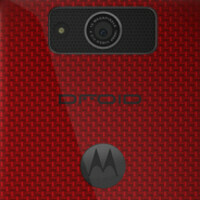 This, we figured, was a picture of the Limited Edition version of the Motorola DROID Ultra. We started thinking aloud about the possibility that this would be a version of the phone offered to Verizon employees at a discount. Just a way for Big Red's executives to thank the reps for all of their hard work. We also pointed out that in the past, Big Red employees got to buy an exclusive red version of the latest DROID model as a token of appreciation. Is it possible that the racing stripe begins a whole new tradition? Uh, maybe not. 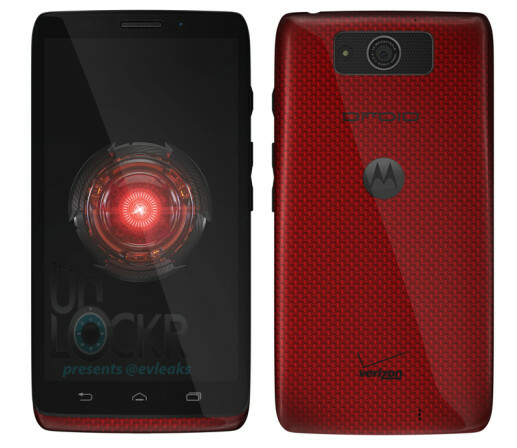 It turns out that according to a source close to Verizon, the red version of the DROID Ultra that we showed you last week is actually the model intended for Verizon reps who will be asked to pay $100 for it. The deal begins today and besides the phone, inside the box you will find a SOL Republic Jax in-ear headphones, a Griffin Reveal case and an Ingress invite code. You know what that means guys, time to peruse eBay to see which Verizon reps are going to play DROID arbitrage. It's a fun little game that goes like this. Work for Verizon. Buy the promotional DROID in red for $100 and sell it on eBay for a price that is about twenty times what you paid for it. Fun is had by all except for the game player who is left with a rapidly depreciating asset at the end of the game. As far as the Limited Edition version is concerned, we will hopefully hear something about it at Motorola's media event later Tuesday. Yeah buy a phone for a ridiculous amount of money on ebay that you won't be able to activate unless you're a rep that is, smart! I think for me it's pretty much down to the Maxx or the Moto X. Hell, maybe I'll get both. I am wondering what Moto is going to do in the camera department? Camera seems to be where the competitors are focusing their energy this year. S800 + 2 Gb RAM + 5 inch 1080p seems to be the minimum entry point for flagship phones this year. But what sets vendor A apart from vendor B is the camera. http://www.phonearena.com/news/Motorola-Moto-X-new-Clear-Pixel-camera-and-Aptina-Clarity-Plus-explained_id45435 That's what Moto is going to do. Your comment makes zero sense. Most businesses have employee discounts. That's perfectly normal. Why would they give you, the consumer, one too? Someone is going to pay 20*100=$2000 for this? Dumb and dumber.